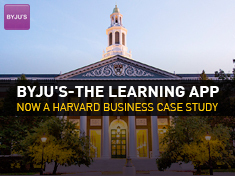 The journey of brand BYJU’S, which started off with classroom sessions for test prep to becoming India’s largest education technology company today, is now a Harvard Business School case study. The case study focuses on how brand BYJU’S is changing the way children learn across grades and geographies and how it has used technology along with a unique combination of content, media and technology to enable students across the globe. BYJU’s is one of the few Indian startups to make it to the reputed Harvard business publishing platform, others include Flipkart and Paytm. Titled as “BYJU’S The Learning App,” this case study will be available for teaching purposes within and outside Harvard. Authored by John Jong-Hyun Kim, a Senior Lecturer at Harvard Business School, and Rachna Tahilyani, Associate Director, Harvard Business School India Research Center, the case studies the growth of the app, its impact on students and how this K-12 app can be used by students globally. 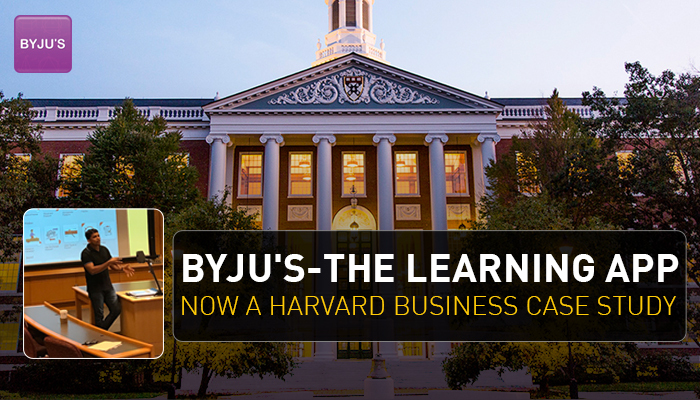 Byju Raveendran was also invited to take a class at the prestigious Harvard Business School, where he interacted with the class to discuss how learning can be personalised with the help of technology.